Police officers form a human barricade in front of the demonstrators, a strange mix of local villagers and kayakers geared up in life jackets and GoPro’ed helmets. Many are lugging around boats and paddles, bumping into one another amid the throng. It’s like a Euro version of The Monkey Wrench Gang. 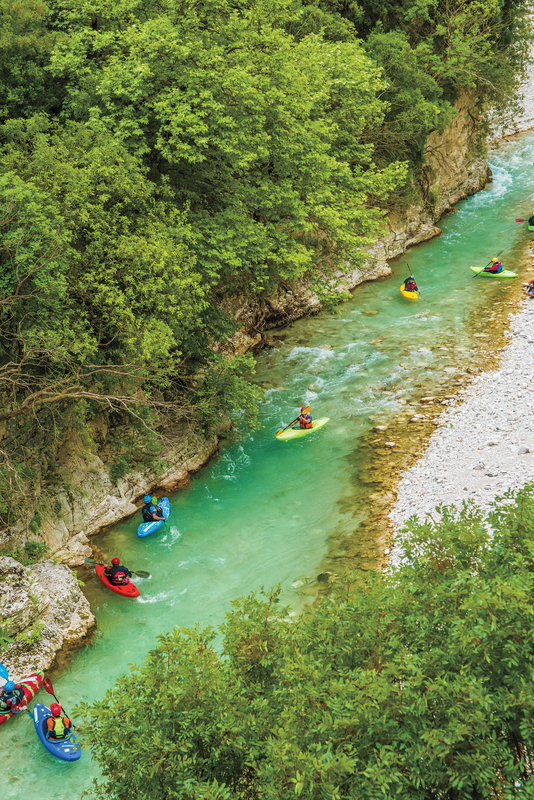 This is the grand finale of the Balkan River Tour, a weeklong expedition that involved 500-odd people paddling 23 different rivers in six countries. 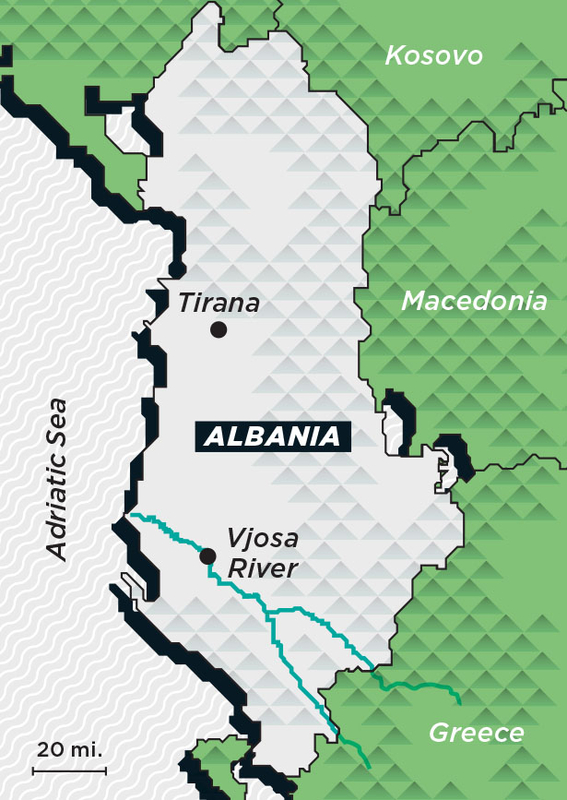 Its purpose was to protest a series of proposed dams in southeast Europe, many of them on Albania’s Vjosa River. 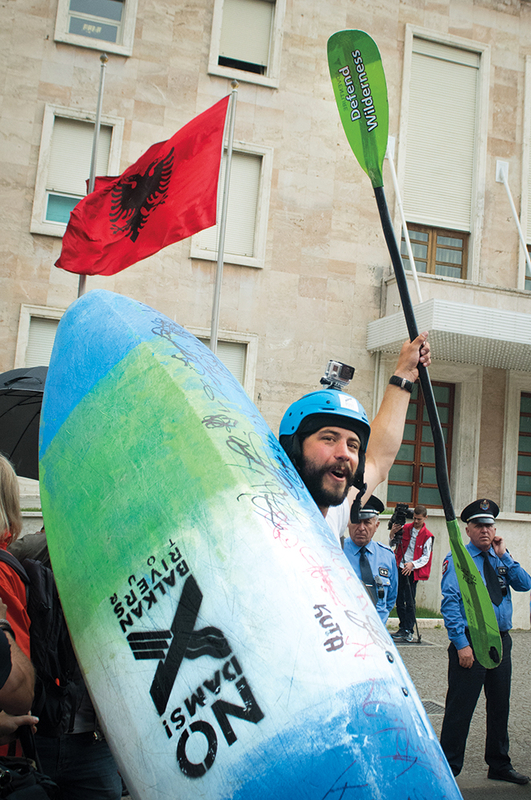 But the event also provided a perfect excuse to get on the water: Protesters camped along the banks, ran some burly whitewater, drank beer for breakfast, and collected signatures on a blue kayak, which they’ve brought to deliver to Albania’s prime minister. A German environmentalist and filmmaker, Eichelmann, 55, has spent the better part of 30 years fighting to protect Europe’s waterways, starting his own nonprofit, River Watch, in 2012. What Jane Goodall is for primates, Eichelmann is for rivers. But for the last two years he has devoted nearly all his attention to blocking a series of dam projects that would flood and destroy much of the Vjosa, Europe’s last big, wild river, often called the Blue Heart of Europe. For most of the 20th century, Albania, just north of Greece, was completely isolated, controlled by a series of dictators until 1985, the most notorious being Communist leader Enver Hoxha. Hoxha’s isolationist paranoia was legendary, and his repressive regime viewed journalists and academics (even biologists and ecologists) as threats, which made research next to impossible. The result is that scientists now know more about remote stretches of the Amazon than they do about the Vjosa. The few studies that have been completed hint at an untrammeled Eden: a 168-mile-long, free-flowing river with slate-colored canyons, whitewater rapids, braided river channels, and an extensive series of wetlands. A scientific expedition in 2014 identified 400 different species of animals within its footprint, 10 percent of which were endangered — among them the Eurasian otter, the Balkan lynx, and the European eel. Stopping dam projects that have money and momentum on their side is nearly impossible. Eichelmann, however, has had more than a few successes. In the early ’90s, while working for the World Wildlife Fund (WWF) in Vienna, he helped block a huge international project on the Danube in Austria after joining protesters at the site. The activists refused to budge and threatened to sabotage the whole thing if construction started. Eventually the developers backed down. Eichelmann continued to advocate for that sort of confrontational policy at the WWF, a position that has earned him the label radical. In 2008, while fighting an internationally backed megadam on the Tigris River in Turkey, he enlisted Tarkan, that country’s version of Justin Bieber, to raise awareness. Tarkan wrote a song about the impending destruction of nature and made a music video. “Suddenly we were everywhere,” Eichelmann says. People began to protest the dam construction. As a result of the protests, Germany, Austria, and Switzerland canceled their contracts with Turkey and pulled out of the project, but the dam is still, slowly, moving forward, with the construction now 80 percent complete, despite near-constant protests. Eichelmann remains undiscouraged, though the Vjosa is a far greater challenge. In the developed world, countries have turned away from hydropower as scientists learn more about its devastating impact on ecosystems. But in developing countries like Albania, Brazil, and Pakistan, dams are still viewed as “nation-building” enterprises that bring jobs, cheap energy, and outside capital. (Many are funded by the World Bank or other similar interests.) In Albania alone, 440 dams have been approved, including 31 on the Vjosa and its tributaries. A big part of the challenge in blocking these dams is fighting the disparate and entrenched interests funding them. According to one financial watchdog group, the European Bank of Reconstruction and Development — an investment bank founded after the collapse of the Soviet Union — is the biggest investor in hydropower in the Balkans, supporting 51 projects with 240 million euros, including 21 inside protected national parks or wildlife areas. Last year foreign investment in hydropower made up almost 10 percent of Albania’s GDP. Not surprisingly, these “nation-building” works can become easy targets for graft and corruption. One dam near the town of Kalivac has been an ongoing source of controversy, and the construction has stalled many times. The dam approval was one of hundreds granted during the tenure of the country’s previous prime minister. In 2015, one of the dam’s primary backers, Italian businessman Francesco Becchetti, was charged with money laundering and fraud. The charges were later dropped, but the dam was left in limbo and remains half built — a testament to how quickly these projects can go south in a politically volatile country. The current Albanian regime, at least behind closed doors, says it would still prefer to find ways to renege on many of these contracts. Such a move would raise its own issues. “Canceling means paying back money and risking damaging the security of foreign investments,” explains Deputy Prime Minister Niko Peloshi. To demonstrate, Eichelmann takes me trespassing to a dam above the town of Lengarica, near a three-mile-long slot canyon in the center of Hotoya Pine National Park. The dam, finished earlier this year, was initially denied government approval due to its environmental impact. But two months later an identical blueprint was approved — seemingly without any changes.